Installation ofkasten at the Jean Hasbrouck House, showing left to right a “country” kast on loan from Jeffrey and Sue Hoffman and kasten from the HHS Permanent Collection and the Reformed Church of Kingston. 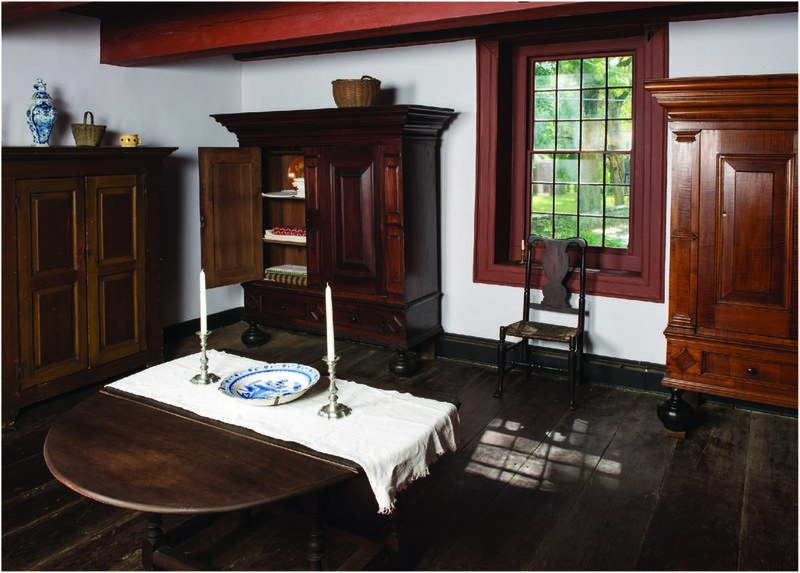 A special exhibition of mid-Hudson Valley kasten—the Dutch-style cupboards of the 18th century—is now installed at the Jean Hasbrouck House on Huguenot Street. The exhibit features over a dozen cupboards from both private and public collections in the region, including the Ulster County Historical Society, the Friends of Historic Kingston, and the Reformed Church of Kingston, NY. The exhibition also includes a massive Dutch-made kussenkast (mid-17th c.) with historic ties to the Elting family and Huguenot Street, on loan the Historical Society of Newburgh Bay and the Hudson Highlands. As large, free-standing wardrobes, kasten were often the most valuable item owned by a family and central to domestic life in colonial New York. While serving a utilitarian function as the primary storage for linens, these impressive pieces were quintessential to the furnishings of Dutch-American homes in the Hudson Valley in the 18th century, signifying the heritage of the owners, as well as their wealth and social status. A catalogue for the kasten exhibition is planned for release later this fall. Special tours are $20 (10% off for seniors, members of the armed service, and Friends of Historic Huguenot Street). Ninety-minute tours of the HHS campus are available hourly beginning at 10 am, with the last tour departing the DuBois Fort Visitor Center at 4 pm. Guided tours are $15 (10% off for seniors and Friends of Historic Huguenot Street). Free for SUNY New Paltz students, children under 12, and active military families as part of the Blue Star Museums program. Tours are available daily (except Wednesday) through October 31; available Saturdays and Sundays beginning November 1.